The libretto of "Don Giovanni" was adapted by Lorenzo da Ponte (a talented Jew who had the whim of passing for a priest) from a Spanish tale already used by Moliere. While marked by many and varied phases of human passion, it is not very dramatically coherent. But the individual characters stand out well, and the supernatural part of the story is very skilfully managed. The curtain rises on the Commandants palace at Seville. Don Giovanni, a libertine nobleman, has been trying to carry off Donna Anna, the Commandants daughter. Anna resists, and Giovanni emerges from the palace, pursued by Anna, calling loudly to have him punished for his insult. Her father rushes to her assistance and is killed by the Don. In the next scene a grief-sticken lady enters. 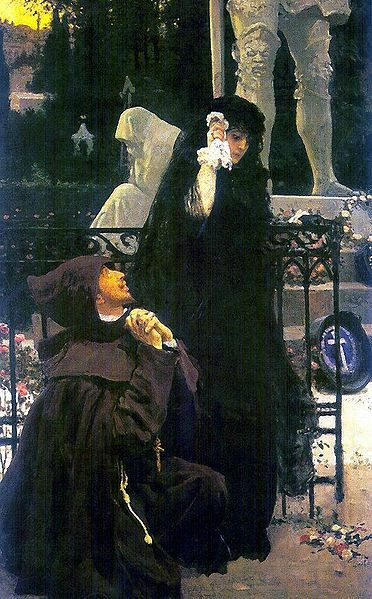 Giovanni, seeking to console her, finds she is his own neglected wife, Donna Elvira. She upbraids him with past infidelity, but he slips away, and Leporello, his servant, is left to disclose the long catalogue of his masters conquests. The following scene is in the country, at Giovannis palace. Zerlina, a peasant girl, and Masetto are about to be married. Giovanni enters and succeeds in parting Zerlina from her bethrothed. Making love to Zerlina, he is overheard by his wife and exposed by her. Masetto taxes Zerlina with faithlessness, but has his suspicions temporarily allayed by Giovanni, who invites the pair to a ball. Giovanni, dancing with Zerlina, entices her from the ball-room, when confusion is produced by her shrieks. Giovanni vainly tries to fix the offence on Leporello. The Stone Guest, Don Juan and Doña Anna [Donna Anna]. In the Second Act, Leporello and his master are discovered in front of Elviras house. Giovanni, now enamoured of Elviras maid, gets Leporello to change garments with him. He then addresses Elvira in accents of repentant love, and owing to the disguise, is able to pass her over to Leporello, while he looks after the maid. 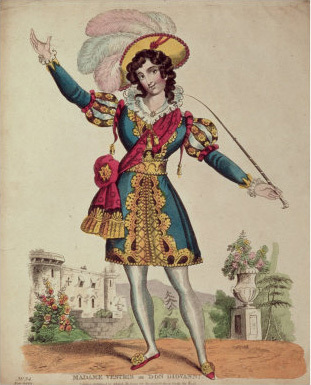 Masetto, accompanied by other peasants, enters, and believing Giovanni to be Leporello, asks for the whereabouts of his master, whom they wish to kill. He directs them to the path which Leporello and Elvira have just taken. Giovanni, by a ruse, succeeds in disarming Masetto, and then beats him unmercifully. Leporello narrowly escapes severe handling, being taken for his master. The next scene is a cemetery, with an equestrian statue of the dead Commandant. Giovanni and Leporello are conversing together when the statue speaks, warning Giovanni that his end is near. Giovanni, unappalled, invites the statue to supper, and the invitation is accepted. The scene changes for the supper. Elvira makes a final but unavailing appeal to her husband to alter his vicious mood of life. A cry is heard, and the terrified Leporello announces the arrival of the statue. The spectre grasps the hand of the Don; an icy chill runs through his frame, and he awakes to a knowledge of the doom that awaits him. He refuses to repent, and sinks into a flaming abyss which suddenly opens beneath him. "Don Giovanni" is Mozarts greatest opera. Gounod, the composer of "Faust" admired it so much that he wrote a long "commentary" on it. Extolling it as "that unequalled and immortal masterpiece, that apogee of the lyrical drama," he declares that it "has exercised the influence of a revelation upon the whole of my life; it has been and remains for me a kind of incarnation of dramatic and musical infallibility. I regard it as a work without blemish, of uninterrupted perfection, and this commentary is but the humble testimony of my veneration and gratitude to the genius to whom I owe the purest and most permanent joys of my life as a musician." Readers might do well to remember this when listening to Gounods own masterpiece. The main thing to remark about the music is the incomparable skill with which Mozart has displayed all the varied moods and situations arising out of the story. Every character stands out in the musical picture. As Pohl, his biographer, says, there is scarcely a feeling known to humanity which is not expressed in some one of the situations or characters, male and female. "Whether we regard the mixture of passions in its concerted music, the profound expression of melancholy, the variety of its situations, the beauty of its accompaniment, or the grandeur of its heightening and protracted scene of terror  the finale of the Second Act  Don Giovanni stands alone in dramatic eminence. Of all musical romances it is certainly the first." Every listener must be struck with the intensely expressive melodies in which the work abounds -- melodies such as "Batti, Batti," and "Vedrai Carino," and Leporellos "Catalogue" aria. It is much to be regretted that the opera is not oftener heard. Perhaps its cast is too exacting for the modern manager, since it demands three great sopranos, a basso, and a powerful baritone. Mozart would probably have settled in England but for the success of "Don Giovanni." In the spring of 1787 there was an arrangement that he would follow his pupil Attwood and other English friends to London if they procured him a suitable post. But he became so engrossed with "Giovanni" that he forgot all about his intention. And then followed the first performance at the Landes Theater of Prague, on October 29, 1787. Mozart loved the Bohemian capital, for he found there the audiences who most honoured and appreciated him. He had been working on the opera up to the last moment; and, indeed, the Overture was not touched until close on the performance. He told his wife that he would write it during the night if she would sit up with him and provide him with small talk and  punch. The punch made him sleepy, and he lay down on the sofa for two hours. He started again at 5 A.M. At 7 the Overture was finished and in the hands of the copyist. The copyist had barely time to write out the parts before the beginning of the opera; and, of course, the Overture had to be played by the orchestra at sight. But the players did so well that Mozart, who conducted at the piano, whispered to them: "Some of the notes fell under the desk, but the Overture went capitally on the whole." There was an enormous audience, and the applause, cordial from the first, was towards the end renewed with increased enthusiasm. Later, when the opera was produced at Vienna it was not a success, whether owing to cabals against Mozart, or badness of performance, or some other mysterious reason. It was not until some years had gone by that it won its way into general public favour. Madame Vestris in the Role of Don Giovanni from Mozart's Opera "Don Giovanni"